The ML600 Series builds on Logic Supply's history of engineering expertise, packing a wide array of features into its distinctive hardened, fanless chassis. Utilizing a fanless, ultra-reliable Hardshell™ chassis, the ML600 Series brings true server class processing and versatility into the industrial work space. Able to accommodate a variety of storage and expansion options, the ML600 Series delivers reliable data-centric performance with industry leading EMI protection. The ML600 Series stays true to its industrial heritage, but without compromising on the processing power or management capabilities todays' server applications require. 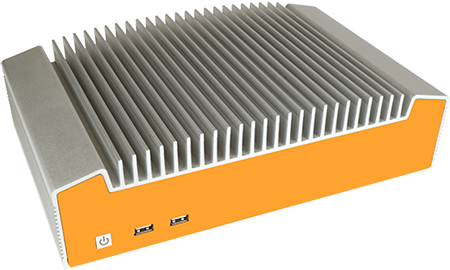 The ML600 Series cools down demanding desktop processing with the use of contoured fins. Maximized surface area allows the chassis to dissipate heat from the internal components into the air. The ML600 Series protects electronics by directing electrostatic discharge through the case with the use of EMI shielding conductive foam gaskets. The ML600's nickel plated interior provides additional EMI protection. The ML600 Series fits your every need with choices to customize the case with hot swaps, additional storage, and custom I/O. Leave your options up to the imagination by converting the hot swap bay into a space for custom PCI/PCIe cards.